A series of disclosures and a study on the implementation of the Mahatma Gandhi National Rural Employment Guarantee Act (MGNREGA) in Bihar suggests that funds disbursed for the job scheme were being embezzled in a planned way. Attempts to bring in transparency in implementing the scheme were stonewalled. This included creating hurdles in the path of the Information Communication and Technology (ICT) initiative, under which e-shakti cards were to be issued to MGNREGA beneficiaries. The pilot project for distributing biometric cards to labourers was initiated in nine blocks of Patna district. The project ensured biometric identification of labourers through smart cards. It prevented duplication of job cards and removed chances of fake muster roll creation. The card had a storage capacity of 84kb. The government also planned that public distribution system (PDS) for food and the Indira Awas Yojana would also be implemented using smart cards as these can hold large amounts of data. The entire system was linked to a server that generated electronic reports in XML format. Instant transfer of data ensured timely payment to the scheme’s beneficiaries. It also ensured and created a standardised work estimation and measurement. “This feature was aimed at culling corruption and fixing accountability of officers,” said Siddharth Kumar of Smaarftech Technologies. Government officials had only to key in the data of work and the software automatically generated work estimation. The most crucial feature of the software was to generate a report specifying date and monitoring of the project. The project was termed a “pet plan” of Bihar chief minister, Nitish Kumar. During the inauguration ceremony of the project, the chief minister got a smart card prepared in his own name and withdrew a sum of Rs 300 using the card, a move termed as a publicity stunt by his detractors. Barely a year after the launch, the project started facing difficulties. The state rural development ministry, in a letter to Smaarftech, informed the company that the government has decided to integrate the e-shakti scheme with UID-Aadhar. The government reasoned that it cannot support two identification projects at a time. Suddenly, in April 2011, the state government froze all operations of e-Shakti scheme. Smaarftech had repeatedly apprised the government that the UID-Adhar scheme is facing severe problems and might not take off. In November, 2011, Central government informed the state government that UID scheme will not be rolled out in Bihar. Thus, the state was deprived of foolproof biometric smart cards. The state had planned to provide smart cards to nearly one million village residents. It also started a helpline number for MGNREGA beneficiaries. The private players, Goldyne and Smaarftech, have also become a victim of red tape. “The government owes us crores of rupees,” says Siddharth Kumar. Smaarftech has terminated the services of over 120 employees and is running from pillar to post to get its dues. Funds siphoning under the scheme could have been controlled to a large extent in the state. A recent report by the Centrw for Environment and Food Security (CEFS) claims that the job scheme scam in Bihar totals Rs 5,977 crore for the fiscal year 2006-2011. The report mentions that modus operandi adopted for the scam: one, through submitting inflated or fake job entries in muster rolls; two, fake entries of undeserving, prosperous and non-labour households in official records and the beneficiaries taking a commission of 5-10 per cent of the embezzled amount; and three, non-payment or only partial payment of the due wages to workers. Smart cards had the potential to prevent all the three methods of funds siphoning mentioned by CEFS that led to alleged scam. Banks invoked, but where are they? Rural development minister, Nitish Mishra refused to speak on the issue. He also declined to comment on why a pet project of the state chief minister, Nitish Kumar is on hold. “We have initiated action against the officials involved in the scam,” he said. Mishra also told Down To Earth that the government is now planning to send the MGNREGA wages directly to the bank accounts of the labourers. Mishra’s announcement that payment of MGNREGA will be transferred to bank accounts has surprised many. A section of activists claim that the announcement is nothing but an eyewash and shows lack of coordination among the government departments. Recently, Sushil Modi, deputy chief minister who also holds the finance ministry portfolio had blacklisted around 14 private and nationalized banks for ignoring agriculture and rural sector. A week before blacklisting the banks, Modi said that 9,213 villages in the state having a population of more than 2,000 people do not have any banking facility. With such a severe crisis of banks in rural areas, it’s highly doubtful that the government will be able to pay the wages to labourers. 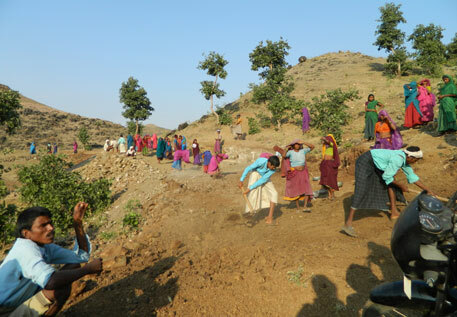 The state government has already issued a notification, announcing that all wages of MGNREGA will be paid only through banks from February 1, 2013. Ashish Ranjan, convener of National Alliance for Peoples Movement (NAPM), working in Bihar, pointed out that payment through banks will only stall the wages of labourers working under MGNREGA. “There is very low penetration of banks in rural hinterlands of Bihar. In such circumstances, payment through banks is nearly impossible,” Ranjan said. NAPM has launched a series of agitations to strengthen the basic framework of the scheme. It has sent a series of reminders to various chief ministers and the Union rural development ministry. In a study in 2010, members of the alliance found that nearly 50 percent of the posts for MNREGA functionaries are lying vacant. “To top it all, Panchyat Rojgar Sevaks are not paid regularly. Entire scheme will work smoothly to a large extent if the basic framework of MGNREGA is strengthened,” he said. Deputy chief minister Modi is yet to react on the government decision to make it compulsory to make MGNREGA wage payment only through banks from next year. Modi is hopeful that in the coming months’ banks will strengthen their rural network. “We had earlier blacklisted 21 banks and later a few banks improved their performance. Things will look up in future,” he said. Parshuram Ray who exposed the MGNREGS scam in Bihar said the state government will do everything to siphon money from the scheme. He alleged that there is a larger network of ministers and bureaucrats who are thriving on employment scheme money. “It was obvious that schemes like e-Shakti would be stopped. There is no political will to implement the scheme,” he said. Even Union ministers like Jairam Ramesh had complained about poor implementation of MGNREGA. This is for the first time that a proper research has exposed the government. CEFS has also conducted a preliminary study of legal documents submitted by deputy district collectors (DDC) and district magistrates (DM) on social audit and implementation of MGNREGA. “Nearly all these bureaucrats have lied to the Supreme Court about MGNREGA,” Ray added. Activists say that the employment guarantee scheme is nearly on its death bed in the state. The only solution for its revival depends on political will. The Bihar government trumpets too much and works too little, says Ray.